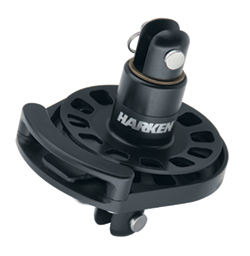 Harken's continuous line-drive furler is the perfect solution for high-performance skiffs, dinghies, and multihulls using large jibs, reaching, and offwind asymmetrical sails. Unlike conventional furling drums, the flat, low-profile sheave never runs out of line, and can completely furl any sized sail. The line is easy to install and can be removed without disassembly. Offset holes in the drive sheave grip line securely, with the stripper and feeder working together to prevent line from jamming. The line guard adjusts in 90-degree increments to accommodate attachments to the boat. "Harken Small Boat furling systems have been at the front of the Small Boat furling market for decades," said Senior Engineer Greg Hartlmeier. "Now we're taking them a step further by incorporating continuous line-drive furling technology (borrowed from our popular Reflex furling) into the systems." The continuous line-drive furler is used with an upper swivel and an optional hoistable halyard to build a fixed or hoistable jib furling system. They are also perfect for staysails on offshore boats.